Contract research and development is an extremely important part of EEC’s continued leadership in the permanent magnets field. 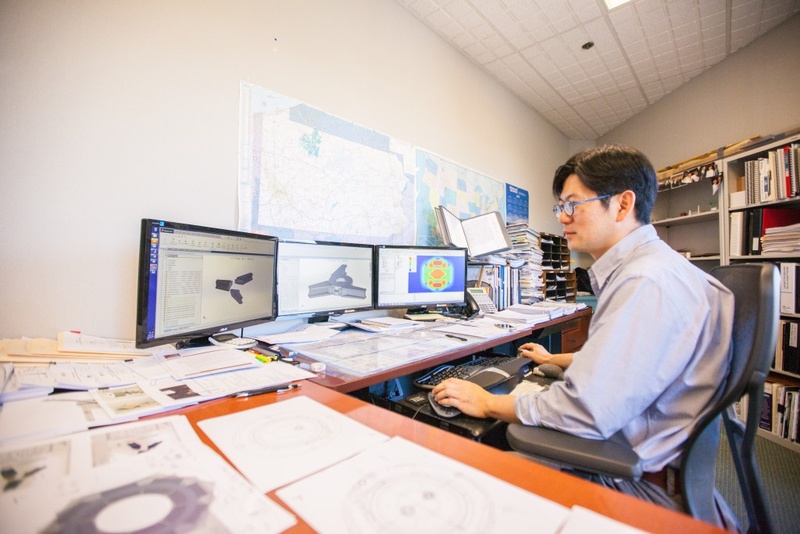 EEC’s Material Technology Center has a world-class team of scientists and engineers in the areas of materials science and electromagnetic circuit design, including 18 engineers with BS or higher degrees and three PhDs. Our laboratory and testing equipment, as well as university and vendor partnering, have enabled successful research work and transitioning to production to serve the needs of the government and commercial markets. EEC has a strong tradition of innovation and commercialization dating back to the founding of the company in 1970 and its successful commercialization of Air Force technology. Following is an extensive report of our contract research efforts with links to our comprehensive research papers and reports. Following the successful completion of the Air Force sponsored STTR Phase II program in 1999 (Contract No. F33615-97-C-5017), EEC and UDRI successfully increased the maximum operating temperature of rare earth samarium cobalt permanent magnets from 300°C to as high as 550°C and accomplished a breakthrough in high temperature rare earth permanent magnets. We have transferred the new technology developed in the STTR Phase II and AMPS programs into our production processes. EEC has ample production capacity to produce material to meet current demand and all foreseeable demand in the future. As a result, we now have three typical grades of ultra-high temperature rare earth magnets for existing products and have produced roughly 12 additional ultra-high temperature magnet grades. These new magnets are currently available for applications from 400 to 550°C and several government, military, and aerospace applications have emerged. The balance of applications is commercial customers in instrumentation, fluid handling, high temperature analytical equipment and electronics materials processing. EEC has received a US patent from the development funded in this program and has the trademark SmCoUHT™ pending with the USPTO. We have completed a NASA STTR Phase I project (contract number NNC04CB01C) for characterization of these ultra-high temperature and conventional samarium cobalt magnet materials in high radiation, high neutron fluence environments to simulate the conditions of future space missions. In this contract we demonstrated that at high neutron bombardment, the SmCo magnet materials perform essentially without degradation. This will help evaluate reliability of electric spacecraft propulsion components and Sterling cycle heat engines and alternators. In additional follow-on characterization work, we have performed a NASA SBIR Phase I project (contract number NNC06CA88C) to develop accelerated life testing of the ultra-high temperature material in a 10-5 Torr environment while at high temperatures from 400-700 degrees C.
In this project, we showed that the affected region of the outer surface of the ultra-high temperature samarium cobalt magnet materials without a coating was a fraction of what had been reported earlier with ultra-high temperature tests in air. Our research was presented at the 2007 Space Nuclear Conference in Boston, MA. Click to read the research paper. EEC was awarded a NASA Phase II SBIR in December 2005 entitled “Novel Ultra-High Temperature Magnetic Bearings” (contract number NNC06CA04C), for the development of a 1000 degree F (523 degree C) permanent magnet bearing for aircraft rotors, flywheels, turbine engines and space power generation systems components. This has significant commercial potential in the turbo expander machinery market sector with commercial uses in natural gas processing and high speed, ultra-high temperature power generators. These bearings will be simpler, lighter weight and more compact than the existing technologies allow. This project uses the material developed in the Air Force Phase II STTR completed in 1999 (contract number F33615-97-C-5017). EEC completed its SBIR Phase II project DASG60-01-C-081 for the development of “High Performance 2:17 Permanent Magnets for Traveling Wave Tubes” as a part of an Army BMDO program. EEC completed this effort in September of 2003. EEC’s magnet products are used in equipment and assemblies across a variety of industries. From high-speed surgical drills to satellites in Earth’s orbit, EEC has a solution for you.